From Up On Poppy Hill is the latest Studio Ghibli film and with the prestige that comes with the studio it’s only natural to have some pretty high hopes for it. 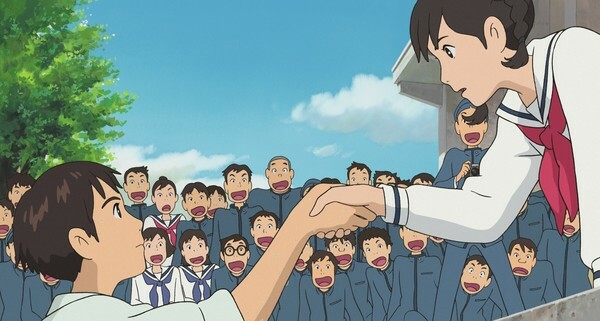 What is perhaps most interesting about From Up On Poppy Hill is that it is a Goro Miyazaki film. For those who do not know, Goro Miyazaki is the eldest son of Studio Ghibli legend Hayao Miyazaki and the man behind the Ghibli flick Tales from Earthsea, which is often regarded as one of the weakest films in the long and impressive history of Studio Ghibli. 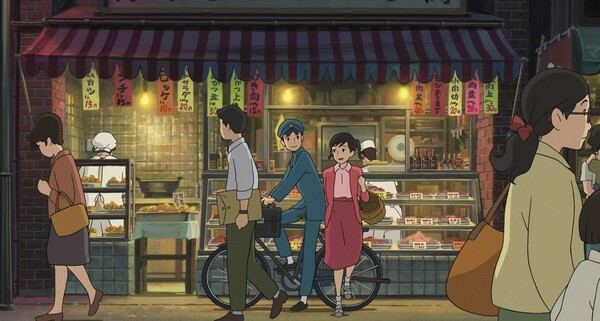 What makes From Up On Poppy Hill different from his previous endeavors is restraint. In Tales from Earthsea, Goro was getting his first taste of film-making and as such had a lot of things he wanted to do. In Earthsea, Goro dreamed big – In Poppy Hill, Goro holds back. The end result is a film that doesn’t throw many punches, it is a pleasant film in fact, but it is one film that Goro plays way too safe. The basic plot of From Up On Poppy Hill is one that we have seen countless times from Studio Ghibli. In a seaside town, a young girl faces several challenges and struggles all in the name of growing up. It is far from a fresh tale for Ghibli, but it is one that is tried and true and works a charm here in Poppy Hill. The seaside Port of Yokohama makes for a lovely backdrop to the proceedings, the characters are well defined with their emotions and motivations developed naturally over the course of the film, but it is hard to not feel as though we have seen this all before. The tale is decent in it’s own right, but it just feels far too familiar. If you have seen any of Ghibli’s coming of age films, the story of Umi and Poppy Hill will offer few surprises, but is still an enjoyable ride none the less. At it’s core Poppy Hill plays out like an imitation of Hayao Miyazaki’s work, rather than Goro Miyazaki making his own mark on Ghibli history. It is hard to say whether it is Hayao’s involvement in the film that has overshadowed Goro’s hand in things, but it undoubtedly feels like a Hayao film or at least an attempt at one more than anything else. This isn’t necessarily a bad thing, Hayao’s work is legendary, but it is disappointing to see Goro’s own visions put aside for what is ultimately a tempered and safe film, that doesn’t try to do anything new or especially interesting. It plods along without much incident and concludes with just as much. The emotion is there, the story is there and the characters are there too. This is undoubtedly a Ghibli film tried and true, but it just isn’t anything we haven’t seen before. The film moves along at a careful pace, always mindful not to step outside of the norm. The result is a solid film, albeit one that is far too afraid of breaking new ground. In spite of it all though Poppy Hill still has the crucial ingredient that makes Ghibli films so special. Underneath everything, it has soul. The art style on show in From Up On Poppy Hill is tried and true Studio Ghibli. It is mostly simple by design, but frequently beautiful. It isn’t the most impressive visual showing that Ghibli has ever produced, but it is an exquisite slice of animation regardless. The character designs are far from memorable, being rather pedestrian by Ghibli standards but the seaside Port of Yokohama serves as an astonishing landscape to place them in. As far as audio goes, the film implements an excellent soundtrack as composed by Satoshi Takebe. Uplifting, effervescent and tranquil, Takebe’s soundtrack adds to the on screen action in a way that few do. The film also happens to feature an impressive English dub from GKIDS with a spectacular cast, each of whom do a fine job of it. 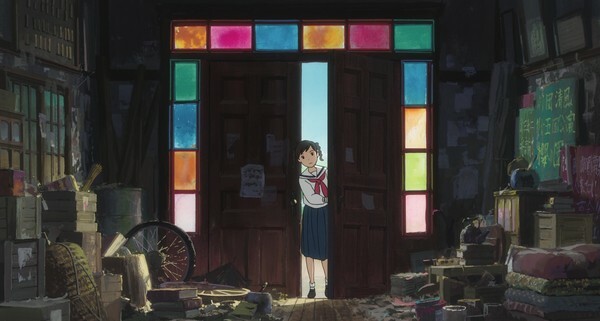 The real star however is Takebe’s brilliant compositions, which truthfully give From Up On Poppy Hill it’s life. 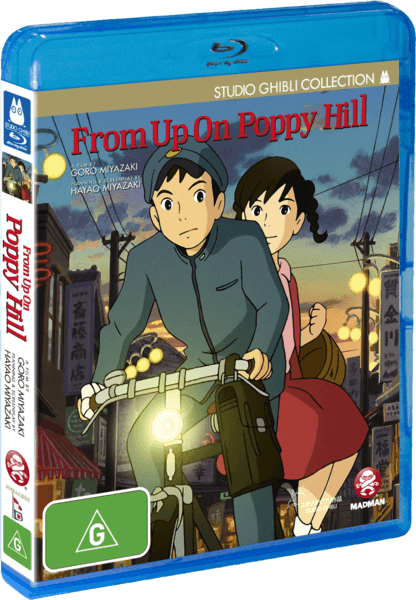 This particular blu-ray release for From Up On Poppy Hill from Madman Entertainment comes bundled with an absolute megaton of special features. There is so much content on this blu-ray that at first it is a lot to take in. Included is the usual trailers and TV spots, a making of featurette, an interview with Goro Miyazaki, a featurette on Yokohama, a press conference for the theme song, Hayao Miyazaki’s speech about the film, storyboards and much much more. Also included inside of the box is some booklets detailing the Ghibli collection and in particular From Up On Poppy Hill. This is an incredible release to say the very least and one that Madman should honestly be commended for. 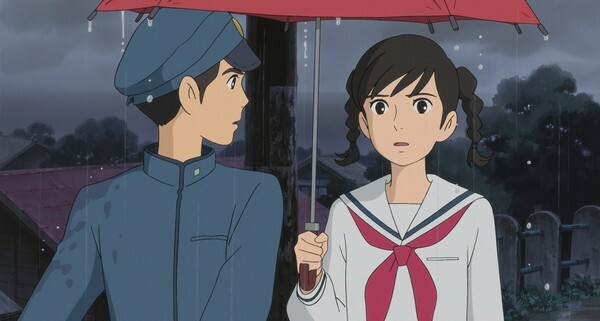 From Up On Poppy Hill is a mixed bag as far as Studio Ghibli films go. It doesn’t bare the same potential that Goro had shown in his previous work Tales from Earthsea, but it does have it’s own soul. Whether or not that soul comes from Goro or Hayao however is anyone’s guess. This is about as Ghibli as Ghibli gets. This is the same old Ghibli that has endeared itself into the heart of anime fans across the globe, but is the same old Ghibli good enough anymore? Can Ghibli really continue to rinse and repeat or will they eventually have to explore uncharted waters? With Tales from Earthsea, Goro Miyazaki sailed out into those uncharted waters much to the chagrin of his father Hayao. With From Up On Poppy Hill, he does his best at the tried and true formula that Hayao perfected and what we got is neither great nor bad, instead sitting firmly in the middle-ground of being simply good. Ultimately From Up On Poppy Hill is proof that Ghibli can’t rest on their laurels forever. 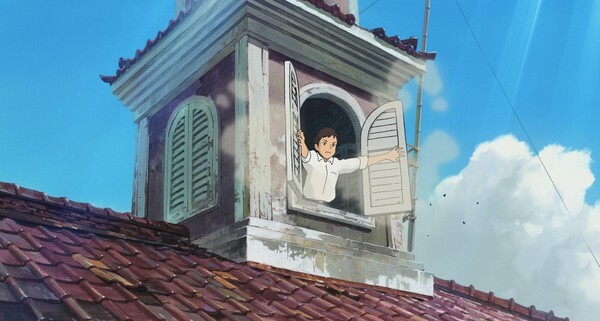 It’s time for Ghibli to explore those uncharted waters once more, because as long as they are watching on from the safety of Poppy Hill, all we can hope for is the same old Ghibli.